Measure of America, a Project of the Social Science Research council, released a report last week on disconnected youth in the United States titled, "Zeroing in on Place and Race." Disconnected youth are defined as individuals between the ages of 16 and 24 that are not in school or working. The report found that 13.8 percent of individuals within the age group were disconnected, which adds up to roughly 5.5 million teenagers and young adults. 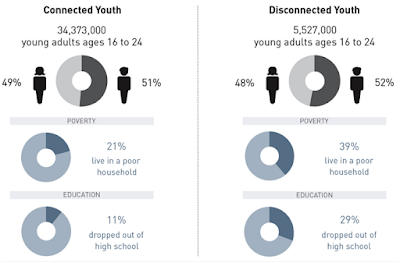 In some metro areas the percentage of disconnected youth in the community topped 20 percent. One out of every five teenagers and young adults in the community were not working or in school. Individuals that are disconnected in their youth are more likely to be living in poverty, to be unemployed in adulthood, and to have higher incarceration rates, among other negative outcomes. Their situation sets them behind their peers, decreases their chances of success and self-sufficiency, and has long term implications on the community as a whole with outcomes such as cycles of multi-generational poverty. Additionally, disconnected youth are costing the nation billions of dollars in social assistance, medical care, incarceration expenses, and likewise, lost tax revenue, wages, income, and productivity. Measure of America estimated that the direct cost to taxpayers was $26.8 billion in 2013. So, what can be done to decrease the number of disconnected teenagers and young adults? Well, there are several strategies that communities can take to engage their disconnected residents, and one option is to get them to volunteer. Opportunity Nation and Measure of America found that volunteerism, group membership, and civic engagement have a positive impact on economic opportunities, upward mobility, and outcomes for the individual and the community. The likelihood of low-income youth to be disconnected if they do not volunteer was 19.3 percent for whites, 27.7 percent for blacks, and 20.9 percent for Hispanics; the likelihood of disconnection with volunteerism drops to 11.9 percent in whites, 17.8 percent in blacks, and 13.0 percent in Hispanics. The Citi Foundation’s Pathways to Progress, is a $50 million initiative to expand economic opportunities for 100,000 low-income youth in 10 major U.S. cities. One initiative is Service-Works, which partners with AmeriCorps VISTAS and Points of Light. Its strategy is to use volunteerism and civic engagement to develop soft skills, gain leadership experience, and prepare low-income youth for college and career success. Their study found that youth engaged in volunteering are half as likely to be disconnected compared to teenagers and young adults that do not volunteer. In order to have a prosperous community, residents must be given the opportunity to lift themselves out of poverty and move up the social and economic ladder. Volunteering offers valuable experiences and important opportunities to develop and foster the necessary skills to succeed. Further, civic engagement encourages them to invest early-on at improving their community. The people in a community are its biggest assets, and with the trend of companies moving to where a qualified talent pipeline is available, a strong workforce and community is necessary to compete on the national level for jobs, workers, and residents. Nationally, it is important that individuals are afforded the same opportunities to succeed, regardless of race, ethnicity, or where they grow up. If we fail to provide these opportunities, we will waste one of our greatest assets and lose out on the productivity and prosperity that could come from these individuals, given the right tools and talent development. Reaching the disconnected youth of your community and reengaging them is important to creating a sustainable, quality workforce and a strong, health community and economy. Increasing civic engagement and volunteerism, alone, will only be a part of the solution, but it is one step that can be taken to at least alleviate some of the problem and provide opportunities for some of the millions of disconnected youth. To see what percentage of youth in your metropolitan area are not in school and not working, you can find the report at http://www.measureofamerica.org/youth-disconnection-2015/.